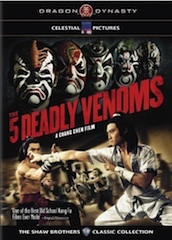 Nothing usually says “exploitation” better than “cult favorite status,” so in light of the month/holiday that we’ve created, I decided to watch, for the first time, the Shaw Brothers Studio’s 1978 production, The Five Deadly Venoms. For the sake of fair warning, there will be some minor spoilers involved in the write-up (all of which could be reasonably inferred from trailers or knowledge of martial arts movies), although I will avoid major plot events and resolutions. The movie was made during the magical heyday for Shaw Brothers, which was the pre-eminent (really the only) movie production company for Hong Kong movies for a long time; this and The 36th Chamber of Shaolin, starring Gordon Liu, are probably the most popular films from the studio, which is saying something, since they cranked out close to a 1,000 movies in their history, and thirty-four movies in 1978 alone. HongKongsploitation! The story begins with an aging martial arts master in the grip of deathbed remorse over the fate of five of his former pupils, each an expert in a specific kung fu style based on animal characteristics. There is Centipede (hits so fast that he seems to have 100 fists), Snake (hand strikes emulating fangs and rattle), Scorpion (powerful kicks like a poisonous tail), Lizard (agile and able to climb walls), and Toad (tough hide impervious to weapons). The aging master worries that his pupils are now using their abilities for evil purposes, and he cannot allow them to smear his reputation or, more importantly, the reputation of their beloved Poison Clan. Thus, the master dispatches his sole remaining disciple, Yan, young and not fully trained, to discover the whereabouts of the Five Deadly Venoms (see what they did there?). If any of them have turned criminal, Yan must somehow prevent or defeat their felonious activities, although he cannot hope to defeat any of them unless he has help. To make it more difficult, when the Five trained with the master, they were made to hide their identities with masks, and they kept their own names a secret, even to each other. With these scraps of information, Yan tracks down a former member of the clan to begin his investigation, and the plot unfolds from there. This exposition takes up about the first 15-20 minutes of the film, and does well in setting up the stakes and the central mystery. As Yan encounters police officers, strangers drinking at restaurants, curious citizens, officials, and street thugs, the viewer wonders along with him if this guy could be the Centipede? Or the Toad? The movie is smart enough to be miserly with clues as to who the Five Venoms are, and I found myself genuinely surprised when identities are revealed. I would hazard a guess that the amount you find yourself buying into the first 15-20 minutes will determine how much you like the film. 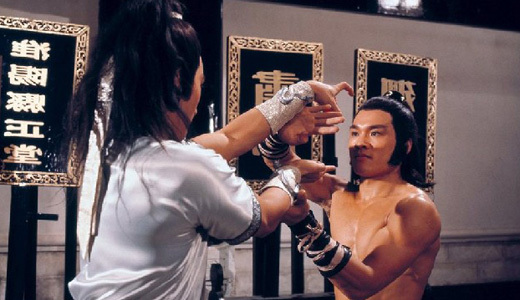 Acting in kung fu movies from the '70s is generally held in very low regard, and for good reason. However, the acting here is serviceable; it’s not great, but all of the characters are not just cardboard cutouts or silly stereotypes. Many of the characters hold enough ambiguity for the audience to cast an inquisitive gaze at them or possess sufficient on-screen charisma. The English dubbing is a little bit silly and there is some glaringly awful dialogue, but I got used to it and did not find it overly distracting. No one comes to this for acting, though, and the movie has plenty of punching. Aside from a few obvious moments, the movie grounds most of the action in reality; there isn’t any “ninja magic” or supernatural foolishness. The film speed is normal, not interrupted by slow-motion, which I appreciate because it gives the actors a chance to show off their considerable skills. Knowing that (some of) the fighters have a distinctive style also made it more fun to see how the strengths of one style would combat those of another. The movie does not have any huge set pieces other than the finale, but I found there was enough action to keep me going, and not just waiting for when the next fight was. Aside from the kung fu, the other “exploitation” part of this was some unexpectedly gruesome deaths. It’s not horror-movie squeamish, but there are some characters who get tortured in some pretty horrifically imaginative ways, and lots of bright red blood gets spread around. Most of this happens when two unsavory types decide that they need to cover up their crimes by killing off the loose ends “without leaving marks on the bodies.” I’m not going to lie; I kind of got excited. Viewers will also note the small homages made to this movie in other films; Tarantino’s Kill Bill series and Kung Fu Panda are the most recent to do so. Campiness aside, I liked the film; the momentum from the opening exposition held my attention, and I found it carried me through the entire movie. Like many exploitation films and kung fu films of this era, it’s not going to hold up to super intense scrutiny, but it was an enjoyable 98 minutes. You can track it down in two primary DVD versions in the US; the generally decent Dragon Dynasty has released it on DVD and Blu-ray. Great write-up Mark! I enjoy this film as well though I was kinda late to the Shaw Brothers party. I watch a lot of Asian cinema but only just started getting into the Shaw Brothers last summer. That said, do you have any favorites or recommendations for a Shaw Brothers neophyte? Also, wondering if you have seen a couple of my favorites and your take on them; John Woo's Last Hurrah For Chivalry (1979) and Ringo Lam's Burning Paradise (1994). I must admit that I'm a Shaw Brothers neophyte as well. However, I found a copy of THE 36TH CHAMBER OF SHAOLIN, which is where I'd push you next. To make up for it, I'm much more fluent in Golden Harvest. films. I haven't seen those two films you mentioned, but I'm going to track them down. Good write up Mark, this sounds pretty good - I'll have to check the last remaining movie rental place and see if they've got it. I was starting to think I was surprised it hadn't been remade in animated form, but it sounds like with Kung Fu Panda it has been to some extent. Well, this is weird. I bought two kung fu movies at the start of June with the intention of picking one for today. Those two movies were The Five Deadly Venoms and The 36th Chamber of Shaolin. When I got home from work today, I decided to pop in the former. I mean, cool, but weird. Okay, confession, I'm watching your DVDs. I'll have them back to you by the end of the weekend. And by DVDs, I mean your youtube videos. Sonzabitches, Heath. Get out of my (DVD) closet.